We also will have sun today but this weekend there is coming an arctic blast. 2:10. God Morning Joyce, Wolf and all who follow. We're in Santa Barbara in what seems to be a roaring monsoon! A perpetual drought can get so wet, sometimes. *Good (just discovered there's no 'edit' button for our comments. Will have to be more careful, next time). all. Sunny but cold here. 41F, 5C. Everybody!! Wet here, heavy rain, several inches. Several feet of snow in the Sierras. Worst of storm is over. Most of you are talking about the heavy rains in California. The rain is needed, but not all at once. We're getting ready for our first really bad snow storm of the season this weekend. Stay safe, warm and dry, everybody! Getting ready to enjoy a rainy weekend on the Sunshine Coast. Morning all. Yup, rainy and blustery here too. 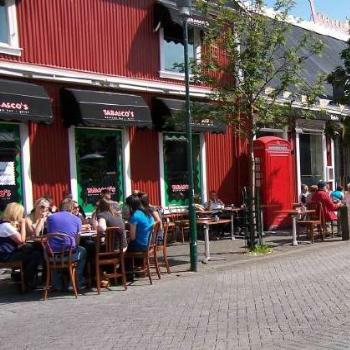 Silly me - I've never even considered imagining summer in Reykjavik - but of course they have one! Morning all,I'm sure as we get older the extreme heat or cold affects us more than when were young. Expected temperature for today is 37C. Enjoying looking after Summer,she is such a happy little person. Makes feel like life is worth living again. 🙋🏼good mAen⛄️☁️🚶‍♀️went walking though Morton arboretum this morning to see the trolls 👹 - they had a Summer Event - this year was trolls. They are staying up until they are no more. Nice day to hike in the snow. Yea, but I will. Thx again. I too, Joyce, dont think of summer in Reykjavik. Wonder what the temperature range is. Except for the cold bit. It's 18*C here, Rage on it's way to 25*C. Got down to about 12*C last night - so they say anyway. I was sleeping. I see that DoA waited for Keith today. Off to cook a thousand snags - gotta feed the hungry tradies. Cya! June, July and August are the 'official summer months' but May and September can also be very nice. However, the average temperature in Iceland during summer is only 10°C (50 Fahrenheit) and the absolute warmest it gets is 20°C (68 F). So... those folks in short sleeves are a hardy bunch, if it truly never gets warmer than that. I checked that out too, Sarah - I figured it mst hae been a heat wave that day; or they were all young people who (if you recall when we were that age) celebrate everyday in shorts & short-sleeved shirts; or maybe when it's always c-c-cold; a little sun & warmth triggers that summertime clothing! ...oh, to be young again when one's blood moves faster, requiring less clothing!! Just now on the radio: Record hot temperature reached in Australia!! I bet that's a record no one wants to beat. Come on y'all, only 4 more for a new page.